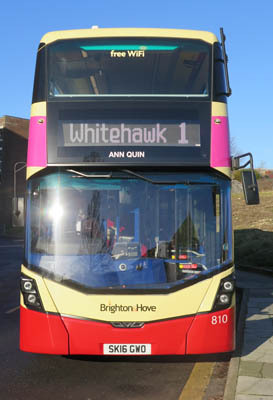 Connections with Brighton and Hove : Ann Quin was born in Brighton in 1936 and lived much of her life here so had a strong connection to the city. She published four novels. Best known is BERG, set in a boarding house in out of season Brighton. Published in 1964, it established her reputation as one of the most original, contemporary British writers. 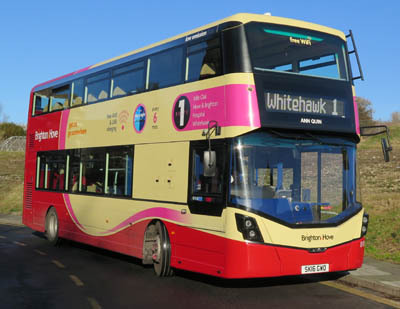 It has been described by the novelist Lee Rourke as ‘the best novel ever set in Brighton’ and won other admiring reviews. She wrote a further three novels but remains something of a ‘best-kept secret’ of British literature. She died in 1973, drowning in the sea off Brighton, aged 37. 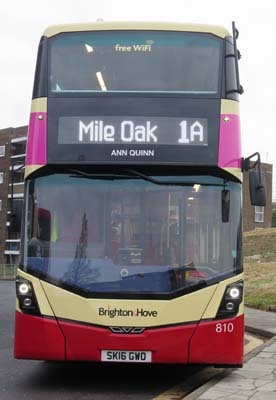 Ann Quin was educated at the Convent of the Blessed Sacrament in Kemp Town (now Brighton College Junior School) She lived for a while in Ovingdean and was with her mother in Lewes Crescent at the time of her death. Quin also worked for a while at St Dunstan’s, the centre for blind veterans, in Ovingdean. 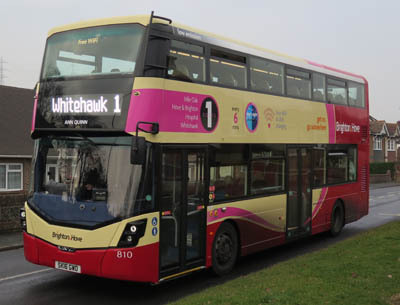 810 Mercedes Streetdeck on Route 1 - carried name since December 2016. Name spelt wrong originall as Ann Quinn, quickly corrected.